Combine yoghurt, vinegar, half the garlic and ginger in a large bowl and mix well. Cover; refrigerate 3 hours or overnight. Heat ghee in a large frying pan, add cardamom,cinnamon, and cloves, cook stirring until fragrant. Add onion, remaining garlic and ginger; cook, stirring, until fragrant. Add lamb mixture, stir to coat in spice mixture. Add stock, bring to boil; reduce heat,simmer, covered, for 1 1/2 hours. Uncover and simmer for another 15 minutes or until is tender. Just before serving stir in garam masala. Sprinkle with fresh herbs and serve with basmati rice. This curry was cooked in a Master Chef Australia master class by Gary Mehigan. 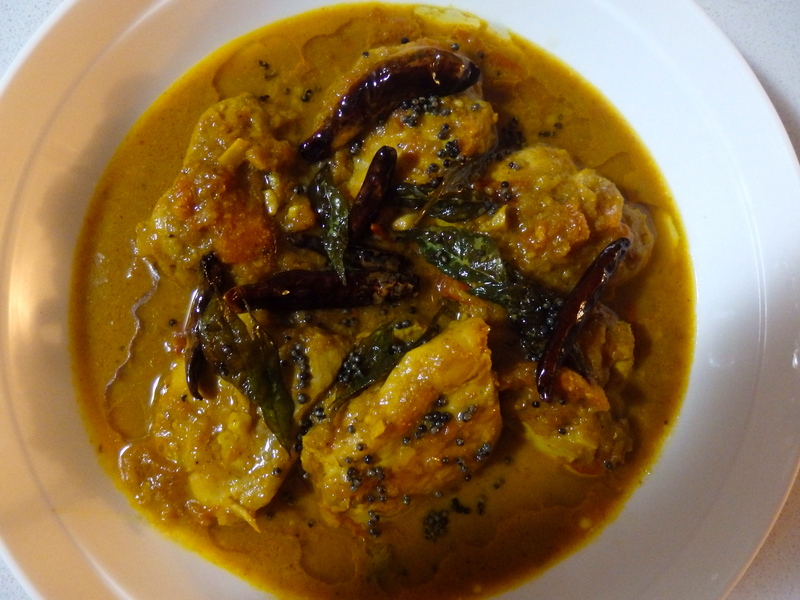 It has become one of my favourite curries to cook because it is full of flavour and if you follow the recipe you just cannot go wrong. I sometimes cook this using chicken thigh fillets and it still works a treat. For the curry, heat oil in a large, deep-frying pan over medium-high heat. Cook chicken for about 5 minutes until lightly golden. Remove and set aside. Add onions and cook for about 5 minutes or until golden, scraping the base of the pan with a wooden spoon. Transfer onions to a small food processor and blend to a paste. Set aside. Reduce the heat to medium. Add garlic, finer and stir fry for about 20 seconds before adding tomatoes, stirring well to combine. Cook for 2 minutes, then add turmeric, and chilli powder, and stir to combine. Meanwhile pound cardamom, cloves, coriander and cumin seeds in a mortar and pestle until ground then add to pan, cook for 5-6 minute, stirring regularly. Add onion paste and yoghurt, and stir well to combine. Add chicken piece to pan with about 250ml (1 cup) of water, or more to taste. Cover with a lid, and cook for 30-35 minutes or until the chicken is cooked through and tender, adding more water if necessary, throughout cooking. For the tempered spices, add oil to a frying pan over high heat. Add remaining ingredients and swirl pan until spices pop and are fragrant. Turn off heat, and carefully tip spice mitre over the curry. To serve, divide curry among bowls, garnish with coriander. 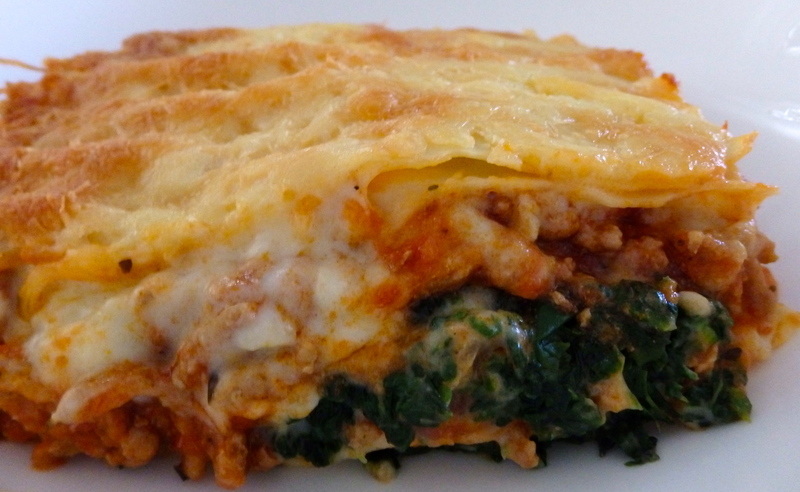 This is the Greek version of lasagne- a rather rich dish and definitely in the comfort food list. Preheat oven to moderate 160 deg C fan forced. Grease shallow 2.5 litre oven proof dish. Add pasta to a large saucepan of boiling water, boil, uncovered until just tender, drain. Combine warm pasta, egg and cheese in a bowl and mix well. Press pasta over base of dish. Make meat sauce. Make topping. Top pasta evenly with meat sauce, pour over topping, smooth surface and sprinkle with breadcrumbs. Bake, uncovered, about 1 hour until browned lightly. Stand 10 minutes before serving. Meat Sauce: Heat oil in a large saucepan, add onion; cook , stirring until beef is browned. Stir in undrained tomatoes, tomato paste, stock, wine and cinnamon; simmer, uncovered, until thick. Cool 10 minutes; stir in egg. Topping: Melt butter in medium saucepan, add flour, stir over heat, until bubbling. Remove from heat, gradually stir in milk. Stir over heat until sauce boils and thickens; stir in cheese. Cool 5 minutes; stir in egg yolks. I got this recipe from an Aldi pamphlet – absolutely divine with a piece of toasted sourdough. Combine saffron threads and 2 tbsp boiling water in a small bowl and set aside. Heat 1/2 tbsp over high heat and fry chorizo until browned. Drain and set aside. In the same pan heat remaining olive oil, adding onion,garlic and celery and cook until soft. Add saffron, tomatoes and stock, bring to boil. Simmer for 10 mins and stir in chickpeas. Remove 2 cups of the soup mixture and blend using a stick blender. Return puréed portion and browned chorizo to the main batch of soup and stir to combine. Season with pepper to taste. Add chopped parsley and serve hot. This is an Adam Liaw recipe. I loved this dish so much. My photo isn’t the best but I will be cooking this again soon so hopefully I remember to get a better picture to do the dish justice. Place the pork on a chopping board and lightly beat with a meat mallet until about 1 cm thin. If using pork chops, carefully beat around the bone. Mix together all the ingredients for the lemongrass marinade, pour it over the pork and ensure it is well coated. Marinate for at least 30 mins or preferably overnight. Heat oil in a frypan over high heat. seat the pork with salt and pepper and fry for about 2-3 minutes each side, or until cooked through. Add a little lemongrass marinade a minute or two before you remove the pork to further caramelise in the pan. Rest the pork for 3 minute in a warm place before serving. For the nuoc cham sauce, pound the garlic and chilli together in a mortar and pestle to a rough paste. Mix together lime juice, sugar and water and taste – adjusting the sweetness and sourness to taste. Add the fish sauce a little as you go, until the sauce is savoury but still pleasant, without being overpowered by the fish sauce. Mix through chill it and garlic paste and set aside until ready to use. This dish has Moroccan influences. It is full of flavour is great for a Sunday Roast. 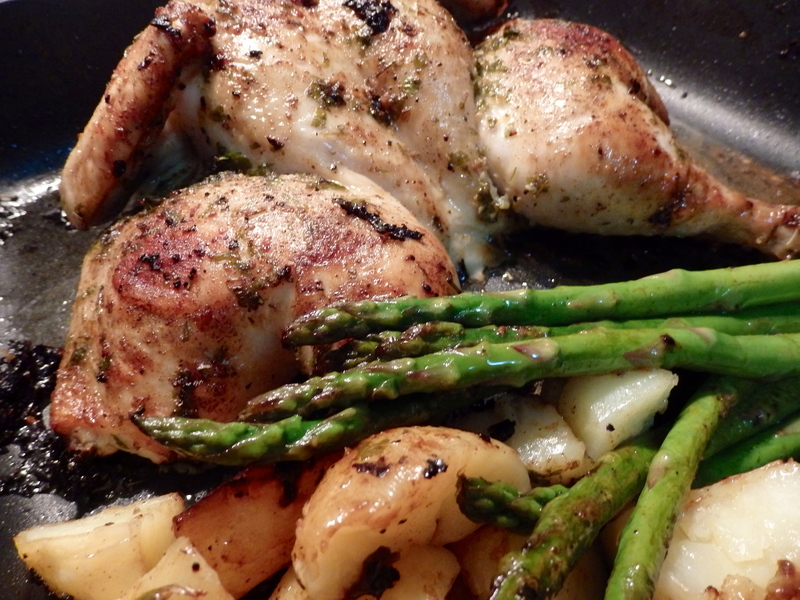 I served the chicken with potatoes and asparagus. Preheat the oven to 220 deg C. Using kitchen scissors, cut along the backbone of the chicken and then press firmly on the breastbone and flatten it. Place chicken in a baking dish. In a small bowl mix olive oil, garlic, chopped parsley and salt. Pour of the chicken and give it a massage ensuring that the marinade covers all of the chicken. Sprinkle black pepper and paprika over the chicken. Roast for 30 – 40 minutes or until the chicken is cooked through. A client was telling me that whenever she typed my name into her phone the word devil would pop up. That might just explain why I loved this sinful indulgence. Just one tip – make the icing first. It took a long time to set, and after an hour it was still very runny. I rather liked the idea of serving it like that but for those that don’t, make the icing first and let it sit. This is a recipe by Annie Bell. In the coming weeks I will make Nigella’s version just for comparison. Whisk the cocoa with 200ml boiling water, whisk in the bicarbonate of soda and leave to cook for about 20 minutes. Preheat the oven to 160 deg fan oven/180 deg electric oven. Butter or oil two 20 cm non-stick cake tins with removable bases, at least 5cm deep, and line with baking paper. Whisk together the eggs, sugar and oil in a large bowl until smooth, then stir in the flour, and then the cocoa solution. Pour two-thirds of the mixture into one tin and the a third into the other tin, making sure the mixture is evenly spread. Give each tin a sharp tap on the work surface to bring up any air bubbles and bake for 40-50 minutes respectively, or until risen and firm and a skewer inserted into the centre comes out clean. Run a knife around the edge of the cakes and leave to cool. To make the icing, gently melt the chocolate and butter into a bow set over a pan with a little simmering water in it, stirring until smooth. At the same time, combine the cocoa, milk and honey in a small saucepan and heat almost to boiling point, whisking until smooth. 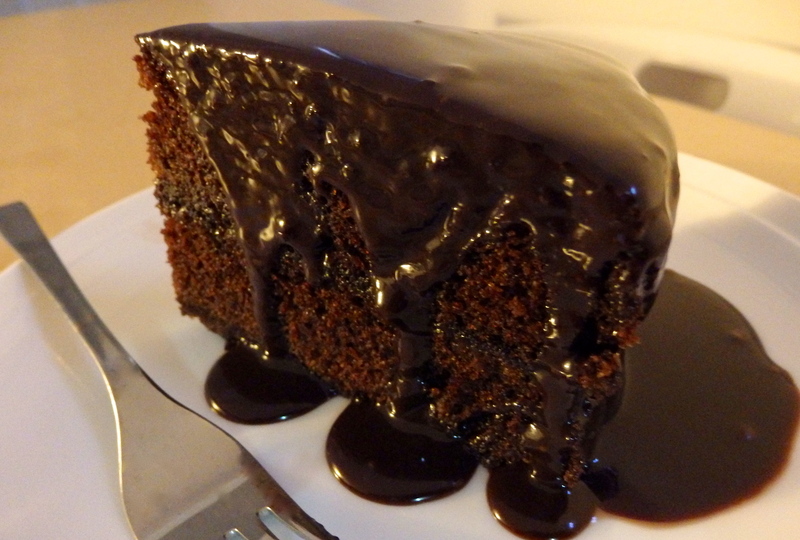 Pass the cocoa and milk through sieve into the bowl with the melted chocolate and whisk to a thick, glossy icing. Remove the deeper pan cake from the base, peel off the paper and slit into two equal layers using a bread knife. 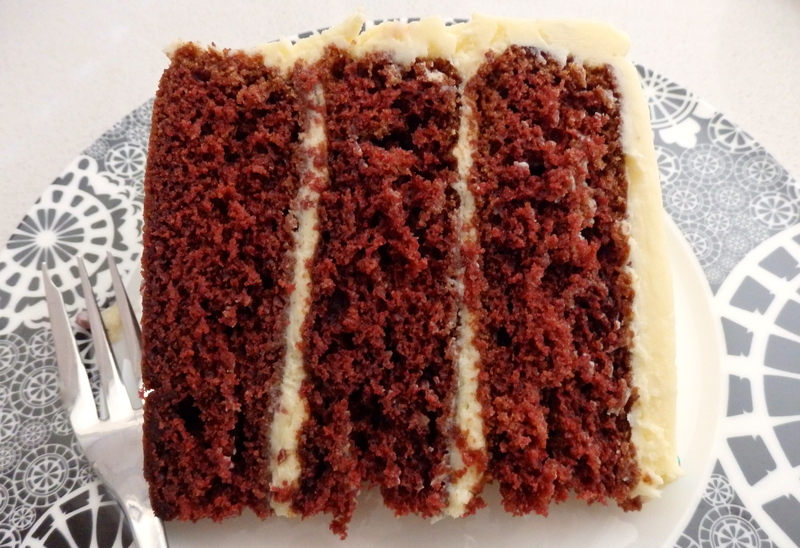 Place the lower half on a cake stand or plate and spread with a quarter of the icing. 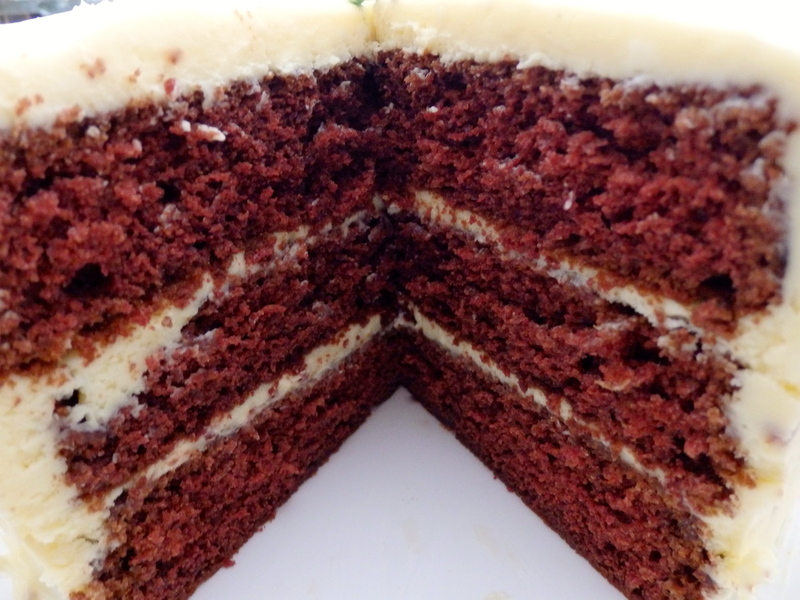 Remove the paper from the smaller cake, lay this on top of the base and spread with another quarter of the icing. 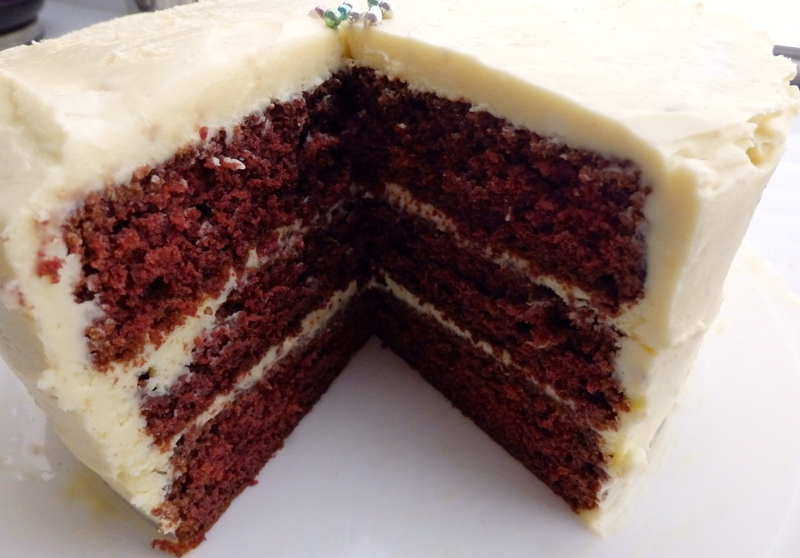 Lay the top layer in place and smooth the remaining icing over the top of the cake, taking it up to the sides and leaving it to drip down. Set aside for a couple of hours for the icing to set. I baked this on valentine’s day for my husband, it is a recipe from Annie Bells book. The first time I baked this I used 1/2 tsp but I didn’t feel I got the right dusky red color. Since then I have found that I use a tad more than 1/2 tsp of red color paste to get the rich dusky red. My suggestion would be to start with 1/2 teaspoon and see how you go. Preheat the oven to 170 deg C fan forced. Butter two or three (if you have them) 20cm non stick cake tins. Line the bases with baking paper. To make the cake, cream the butter and sugar together for 3-4 minutes until light and fluffy. Add the eggs one at a time, scraping down the sides of the bowl between each addition. Add the flour in three batches alternating it with buttermilk so you start and end with flour. Next mix in the salt, vanilla and cocoa. Start to add the food coloring, a knife tip at a time, until the mixture is a dramatic dusky red. Mix the vinegar and bicarbonate soda together in a small bowl, they will fizz, and add to the batter. If using three cake tins, divide the mixture between them, weighing them to ensure you get evenly thick sponges. (If using two tins, add a third of a mixture to each one, bake these and then bake the third one). Bake for 20-25 minutes or until shrinking from the sides and firm when pressed in the centre. Leave to cool in tin for 10 minutes, then turn the cakes out onto a wire rack, remove the paper and leave to cool top upwards. Last week I seemed to visit recipes from decades past. I have only ever cooked lasagne once before and that was 25 years ago. It was such a disastrous experience that I never revisited it. Part of the reason my also be that I have an aunt that makes a mean lasagne so it was always easier to request her to make one. Anyway I decided to put aside my lasagne fears and attempt the same recipe and was I glad that I gave this recipe another shot. It produced a lasagne full of flavour. Surprisingly it was very easy to make, thanks to freshly made pasta sheets. 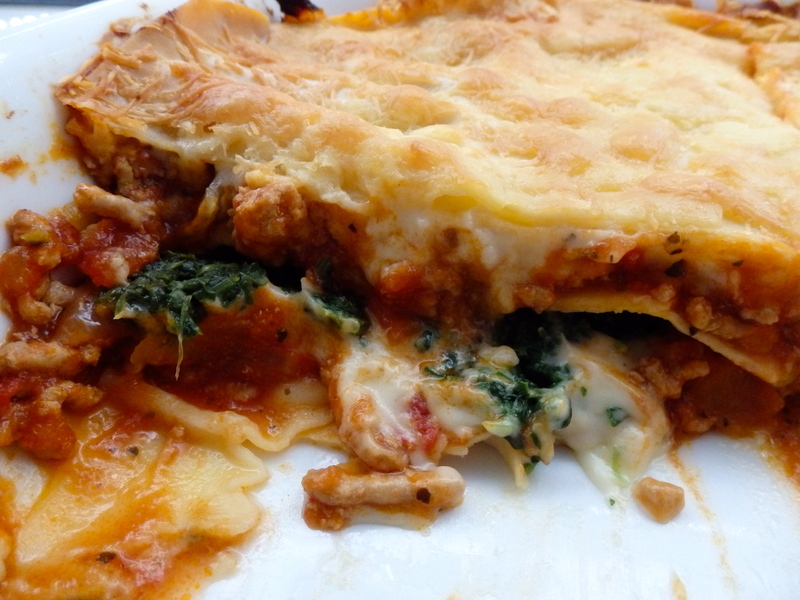 I used pork mince for this and went a bit easy on the cheese but the flavour of this lasagne was simply delish. Peel and finely chop onion, slice mushrooms finely. 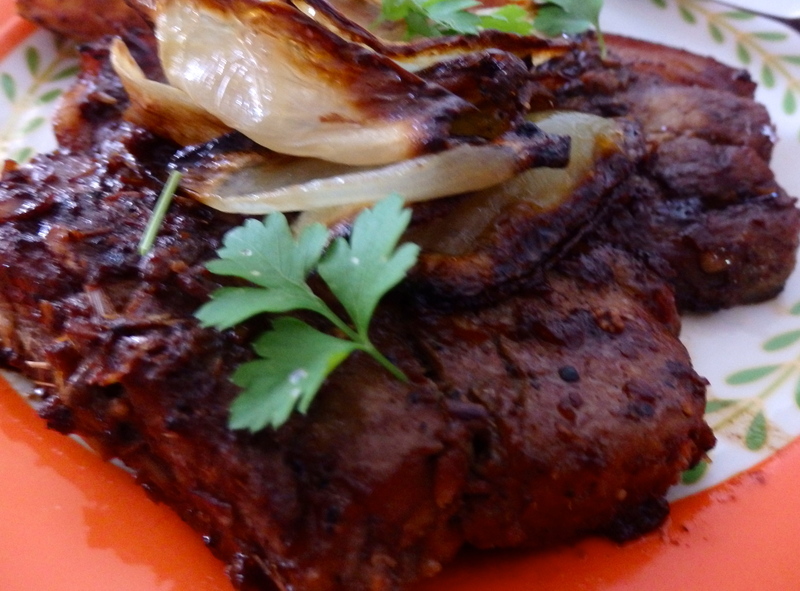 Place meat in a heavy based, shallow pan and brown, breaking any clumps of meat with a fork. Drain off any excess fat. Add onions, crushed garlic and mushrooms, cook until onion is transparent. Season with salt and pepper, add oregano, sugar and the tomato. Bring to boil, reduce heat and simmer covered for 45 minutes. Uncover, simmer until sauce has thickened, approx 15 minutes. Melt butter in saucepan, add flour, salt, pepper and nutmeg, blend until smooth. Stir over heat for 1 minute, gradually add mil, stir until sauce boils and thickens, reduce heat, cook 1 minute. Remove from heat, stir in grated cheeses, stir until cheese melts. Place lasagne sheets over base of shallow ovenproof dish – 28cm x 18cm is ideal. Pasta may have to be trimmed so it lies flat in the dish. Spread half the meat sauce over the pasta and than cover with half the cheese sauce. (Both sauces are easier to handle if made the day before and refrigerated). Press as much liquid as possible from thawed spinach, speed evenly over cheese sauce. 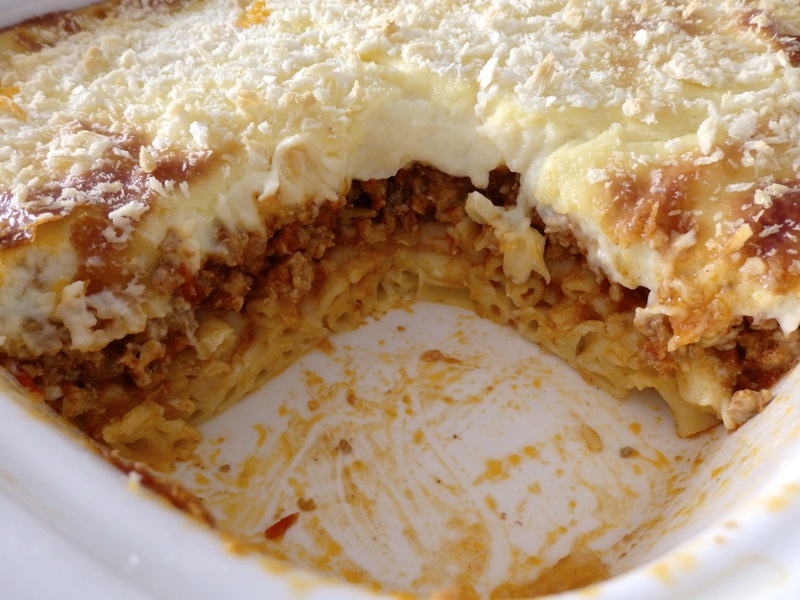 Top with two more pieces of trimmed pasta, spread with remaining half of meat sauce then cheese sauce. Top with remaining pasta. Sprinkle top with grated cheese, bake in moderate oven 40 minutes or until top is golden brown. Remove from oven, let stand 10 minutes before serving. Lately I have been in the mood to reminisce. Here is another golden oldie. 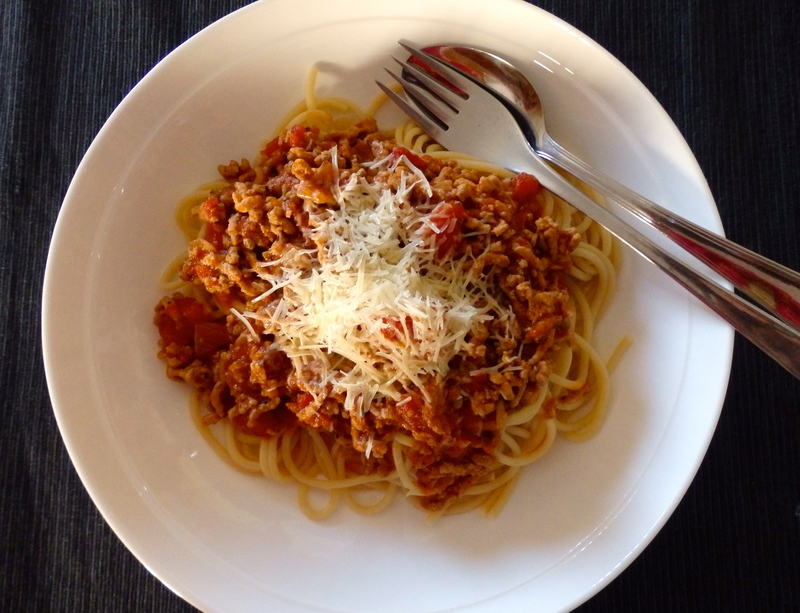 The first time I cooked a Bolognese was about 25 years ago. This is the recipe I used. 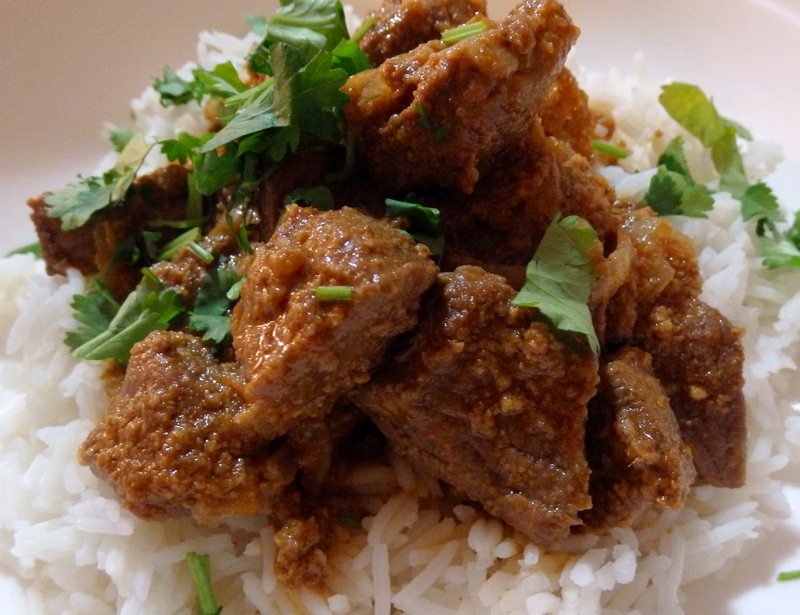 The original recipe uses mince steak, but I use pork, lamb or steak and pork combined. Peel onion, chop finely. Cook in heated oil until onion is golden. Add mince, cook well, mashing with a fork to break up any lumps. Cook until mince browns well. Drain off any excess fat. Add tomatoes, herbs and tomato paste, water ,salt and pepper. 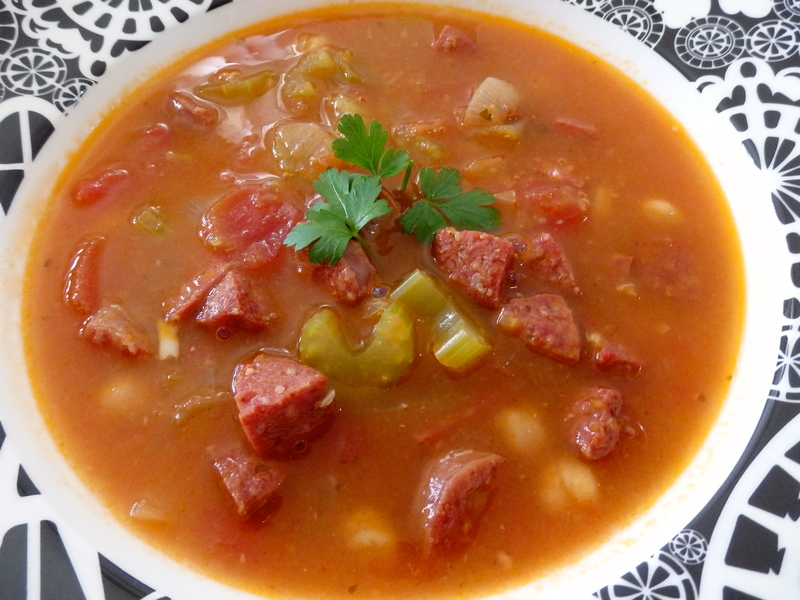 When sauce comes to boil, reduce heat, cook very gently 1 1/2 to 2 hours, uncovered or until nearly all the liquid has evaporated. Serve over spaghetti topped with grated Parmesan cheese.